Retro foods are getting renewed attention, including that classic meat in a can, Spam. How much do you know about this food, however? Whether you love it, hate it, or have never tried it, it’s interesting to note that Spam has a long history, dating all the way back to the 1930s. According to the Spam website, 8 billion cans of Spam have been sold worldwide since it first burst onto the scene. Spam was first introduced in 1937, during the Great Depression. Since fresh pork was too expensive for most people and hard to come by, this canned meat product quickly became a household favorite for its affordable price and convenience. During World War II, the product was in hot demand, with the military purchasing 150 million pounds of Spam by the war’s end. According to the Spam website, the canned meat is relatively simple in its ingredients – there are just six, in total: pork with ham, salt, water, potato starch, sugar, and sodium nitrite. What’s in a name? Well, it’s not entirely clear why it’s called Spam, but the name was the brainchild of a brother of a Hormel Foods vice president. Many have guessed that Spam means “shoulder of pork and ham” or “spiced ham,” but it’s never been confirmed. Mental Floss explains that “the name was suggested by Kenneth Daigneau, an actor who received the $100 prize in a contest Hormel had sponsored.” He also happened to be the brother of a Hormel executive. South Korea is the second largest consumer of Spam and it’s often used as an ingredient in a sushi roll known as kimbap. 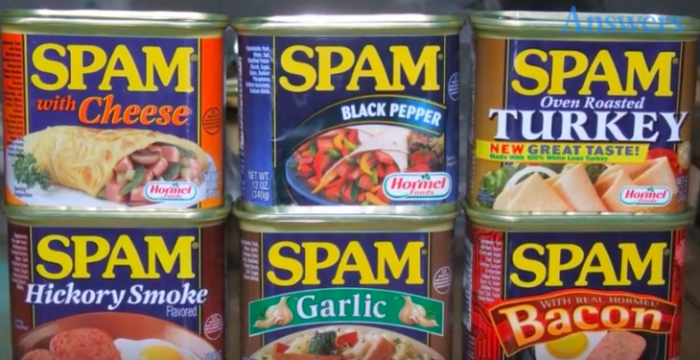 Did you know there are many varieties of Spam available? In addition to the original flavor, the following flavor options exist: Spam Lite, Spam Bacon, Spam Turkey, Spam Teriyaki, Spam Cheese, Spam Garlic, Spam Black Pepper, Spam Hickory Smoke, and Spam Portuguese Sausage!